So this, price I guess, would be the third official Summer Mixtape. For those of you who are in Southern California – it’s probably still summer for you – so feel free to grab the first edition – SUMMER MIXTAPE (2006), the second one – BACKPACKER/SUMMER IN LA (2007), and then put it together with this one, and get on your Dyno with the black mags and bang out, kiddo. Intro – Thad Reid – Cruzin feat Akshan. Stat Quo – Dear Summer (Part 2). The follow-up to Part 1, which I probably would have put out were it not for the hard drive crash-induced delay. I don’t think I necessarily cared that much about Stat Quo’s life and/or career before hearing this series, but I have to say, this is sort of an interesting series that dude has been putting out. It’s sort of like the rap version of Livejournal. Or maybe that’s Atmosphere. So maybe this is more like the rap version of Caroline’s older sister’s Xanga, because I used to read that all the time and be like damn she’s cool. You ever do that? Interweb stalking is bad, kids. myspace.com/statquo. DJ Crazy Toones – It’s A Demo Teaser. This isn’t even a song, but I dig this cut. Some of the most ignorant statements on this episode are made by this man. I mean, I fully agree with the sentiment – too many people out there don’t understand how to put together a mixtape/cd/podcast, but come on, did we need that comment about Singapore? And why was the dude in Singapore? I mean, anybody can go to Singapore. I can go right now in probably like a few hours. Is there something special about Singapore that I don’t know? I mean, go to Tibet, fam, and I’ll be impressed. Maybe beat up a monk or something. Aside from that, this demo is just ridiculous. I really want to hear this mixtape now. myspace.com/djcrazytoones. Birdman – Sun Come Up feat Rick Ross and T-Pain. Nobody really cares about what Rick Ross did before he was a rapper, because 90% of the rap game is lying, ladies and gentlemen. It’s an act. Yes, it has ramifications on what happens out here, and it’s okay to get sucked into the drama on some suspension of disbelief, but 騙されるな、dig? I gave a talk at a high school earlier today and some kids in the audience were absolutely blown away that rappers weren’t you know, actually shooting people in real life. Remind me to tell you about the first time I ever saw the Beef DVD (hint – it wasn’t in the US). That said, I like this cut, and it’s probably the most “traditional” summer rap cut I got on here. Guilty Simpson – Michigan Nights. Okay, Guilty – “I’m like that cat you never liked but was scared to fight”. I’m actually thinking about this now and I can’t think of anyone I didn’t like to the point that I wanted to physically harm them but I was scared to actually give it a try. That said, I more or less quit fighting around age 12 or 13 (the age when people start bringing knives and guns to school fights). A lot of the time I wish rap songs were shorter – like on the 2 minute range – but this is one of those cuts where you’re glad you don’t have to be satisfied with a cut-up radio version. Cinematic. Dig it. myspace.com/guiltysimpson. Double F – I-5 Merge. I alluded to some superbly ignorant statements being made in this episode – and here they are. What is this dude even talking about? You’ve heard a cut off this tape before, actually. myspace.com/mystadub. U-N-I – Yesterday. 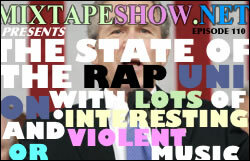 I think I was put up on these dudes last summer, and finally they make an appearance on the mixtape show. Kids set aside the A.D.I.D.A.S style swagger stuff for a minute and go somewhat serious for a minute. I like this cut. Shout-outs to Amanda for having the good sense to pick these kids up for Block Party. myspace.com/unimuzik. Guest Anouncement/広告alude – Jim Jones – Pop Champagne feat Ron Browz and Juelz Santana (instrumental): I’m not going to write about it here since I’m still a little upset about it, but the end of this episode got cut off by someone you’ll probably recognize…looks like next week’s episode I’ll be taking a break. And before I forget, shout out to Mamiko again for handling the artwork on this joint because I still don’t have any image editing software yet. So – how was your summer? Double Dz – I Am Obama. I know it seems like I’m posting all over the place about Obama on this site, but seriously – what’s the last election you can think of that had people making rap songs about, you know, politics? And really, if you compare this to anything being played in clubs right now, this actually is not a bad song. I mean, the lyrics (especially the first verse) are borderline hilarious, but come on, compare that to, say, Laffy Taffy. The more I watch this, actually, the more I am convinced that there is some element of genius in this production. This might be giving away a bit of my own bias, but this was apparently put together by students at UCR (my alma mater), and filmed in Lot 30. I actually believe that this may be one of UCR’s prouder moments (up there next to when they accidentally burned down the Lothian cafeteria – that was a long night). Somebody should start a petition to get this posted to the front page of UCR’s front page. I actually find this phenomenon pretty interesting. I mean, I’m going through the songs I have set up for the next few shows (this is taking a while, as I had a pretty brutal hard drive crash and lost a lot of material), and the amount of Obama mentions – even off-handed ones – is pretty impressive. If I wasn’t out here, I’d probably invest more time in actually looking harder at this (hint hint, some enterprising young researcher should do a project on this). Also interesting is the fact that if you look on youtube, there are dozens of songs done about Obama – plenty of talented Black kids doing these, but it doesn’t seem to be limited to race here. On the McCain side, however, I can’t seem to find anything worth even linking to (most of the songs about him, actually, are “diss” tracks). Am I missing something? Are there some white kids in Arizona twanging out McCain country jams that I am missing? Or, perhaps, is it that the true element dividing Obama/whateverthatguysnameis “fans” and McCain/Palin “fans” is not race or class or gender, but deeper and more important things, like talent, hipness, and aesthetic sensibilities? Politics aside, if we are talking strictly in terms of cool and lame, the choice is clear. Not that I am advocating voting with the same region of your brain that tells you whether or not you should pick the Dunks or the Ones, but, you know. So if there was a State of the Hip-Hop Union, generic I think one thing that we could probably count on would be that unlike any previous or current administration, we would get the straight, uncut reality of our current status. I mean, there would still be lying about what sort of dirt people did in the past or how many guns/cars/etc dudes owned – but yeah. I would tune in to watch that. Stereolab – Neon Beanbag I think I must have been the one person at KUCR that never actually played any Stereolab. Probably because I never really listened that much – my mistake. Everybody go out and buy Stereolab. Off the 4AD and Rough Trade 2008 Sampler, which is ridiculous. stereolab.co.uk. Young Jeezy – My President feat Nas. Leave it to Jeezy (yeeeeeeeahhhhh) to make a song where he praises a presidential candidate, damns the current president, and raves about his blue lambo in the same breath. I like this song. East Coast Avengers – Kill Bill O’Reilly. I really wanted to get this episode out like four days ago, but technical difficulties prevented that. As I say in the episode itself – this track placement comes with zero disclaimers or apologies. I figure that in a genre where threatening other rappers for nothing is the norm – threatening somebody that actually deserves it is pretty sensible. ちなみに、the girl at the end probably deserves an award for best line in the song. East Coast Avengers is made up of Esoteric, Trademarc, and DC the Midi Alien. eastcoastavengers.com. Mic Legacy – So Ghetto feat Rapper Big Pooh. The instro on this is like the musical embodiment of the Minstrel Show cover plus being in church. myspace.com/miclegacydafuture. Crooked I – Paper Planes Remix/Block Obama. I’m not exactly sure what the official title of this cut is. About 80% of the stuff this dude is talking about is totally ridiculous – including the random diatribe on claiming that stealing songs is “not hip-hop”. I’m not saying that stealing music is a good thing, but seriously, it seems like every time I turn around someone is telling me that something is “not hip-hop”. Eating broccoli is not hip-hop. And co-opting the “Change” line? There’s got to be something wrong with that, but I can’t hate. Anyway, this song is hip-hop, and it is over the Paper Planes riddim, which makes it extra good. myspace.com/crookedi. Elzhi – Colors. Come on, it’s Elzhi. There’s something sort of surreal about this song – not just the imagery. I can’t quite put my finger on it, but it’s a great song. You might need to play it back a few times to actually get what he’s doing. myspace.com/zhifi. Invincible – Locusts feat Finale, wsg Gwen Mingo and Ron Scott. Welcome to the reality that is Detroit. There’s a video to this as well – I’ll leave my commentary on this one out and just let you read the interview. Thanks to Sweeney Kovar for this one (and the one above, come to think of it). Album sounds like it’s definitely worth a purchase. emergencemusic.net. The Stranglers – Golden Brown. Apparently everyone else and their mom has discovered this song recently and are trying to make beats out of it, but if you want to hear a proper drug song done properly by proper white people (nothing against Pink Floyd, I like you guys too), this would be a good joint to track down. myspace.com/thestranglers. See, told you I was back on track, sorta.